Easy to use - as sitting down and leaning back. Comfortable - Cushioned upholstery and foam-padded ankle supports. Stable and secure heavy-duty steel construction. The push-button lever for the ankle supports is in easy reach to let you quickly adjust ankle tension for comfort and security. Getting on and off is as easy as any other chair in your home. 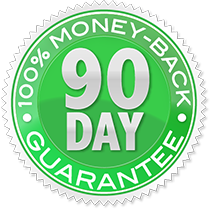 90-Day Money Back Guarantee + One-Year Limited Warranty. HOW CAN Seated InLine Inversion System HELP? I was 100% better. I could not believe the results! ~ Robert O. Transportation Supervisor, Auburn, Ca. I have also told friends and family how wonderful your system is and how it has help me not to have surgery, for that is what I was told that I needed. 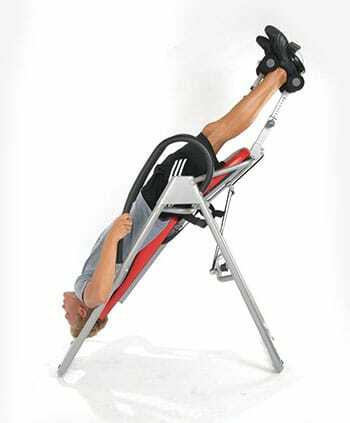 I had used a regular inversion table, but was too paranoid to go totally upside down. 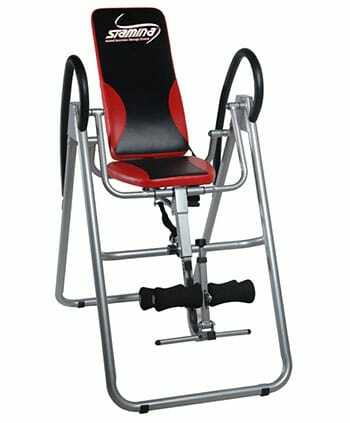 The seated inversion table helps because the waist strap keeps me calm. It’s helps me mentally let go so I can relax. I couldn’t do that with any other inversion table. Feeling grateful, healthy and happy!!! "I suffered from excruciating back pain for 9 years until I found this web site. I did the Heal-n-Soothe enzyme therapy, inversion table and the muscle balancing. It was wonderful. I was able to begin teaching tumbling classes again and remain pain free to go about my daily life. I continue to be aware of keeping balance with my muscles and I do the stretches and exercises every day. I was able to stop the enzyme therapy and I only use the inversion table now when I feel that I have overdone something. 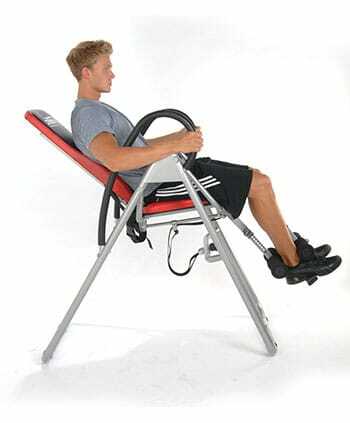 Using the inversion table at the first sign of strain, or beginning pain stops it in its tracks. I am so thankful for this information that finally made sense, as the pain meds left me unable to function, gave me no quality of life and were useless at fixing the problem. So happy to get off of that vicious, expensive cycle and start healing!!!!!! Feeling grateful, healthy and happy!!!" The Assembled dimension are 50" Long 27.5" Wide 57" High Please note: This table does not fold up for storage, once assembled the legs are fixed in the open and stable position. When inverted, the natural pull of gravity allows a separation of your vertebrae, which lessens the pressure on the discs in between each vertebrae. The action of increasing the space margins between the vertebrae can actually create a mild suction in the disc, which may help encourage the bulged disc return to its proper place. The main benefits are realized by increased circulation and waste elimination to injured discs. 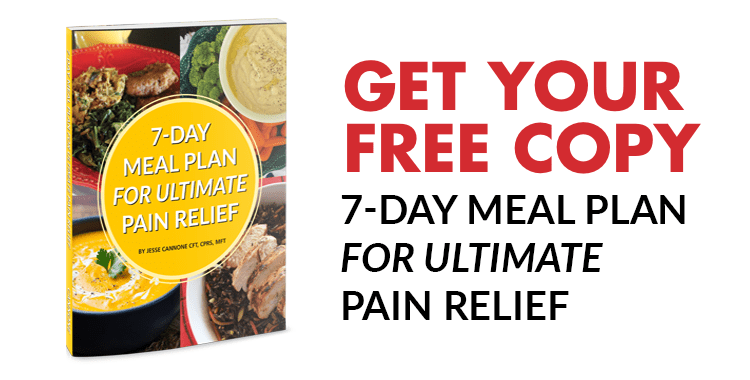 In the opinion of many medical professionals, several sessions of intermittent traction are the best way to help the body dissolve a bulged disc. The length of healing time will vary with different people. However, it has been our experience that you should hang three or more times every day for short sessions at an angle most comfortable for you. Do not over-do it-this is not a "no pain, no gain situation." This is very normal and is actually good for you, indicating increased blood flow to the brain, eyes, skin and hair. One preliminary study showed that the brain runs 7% faster and 14% more accurate while inverted! The feeling of pressure usually lessens over time as you become accustomed to inverting. If you are a beginner and are uncomfortable with this feeling, it is OK to come up and rest a while. This is referred to as "intermittent" traction (alternating inversion with being upright) and is a good way to help get used to the inverted world. You can also try "oscillation" which is a rhythmic rocking back and forth. The answer varies with different people. Beginners should start at a mild angle (approximately 20-30 degrees beyond horizontal) for the first few weeks until you become comfortable with the operation of the table and are able to completely relax while inverted. 20 - 30 degrees: At this angle, your body begins to experience mild stretching to your muscles and joints, while benefiting from stimulated circulation, improved oxygen flow to the head, and repositioning of internal organs. 50/60 degrees (parallel with the rear legs of the table): This is the angle to which the average person experiences virtually all the benefits of inversion. Your spine receives the amount of traction it needs to completely decompress (once you are relaxed). Most people don't really need to go beyond this angle. Intermittent traction / Oscillation Intermittent traction (alternating 20-30 seconds inversion with returning upright) or oscillation (rhythmic rocking back and forth) are actually the "preferred" methods of inversion, recommended by many doctors, for stimulating circulation and waste removal in and around injured discs. Virtually all issues of discomfort that occur with new inverters are due to going too far, too fast. You are wonderfully designed to be upside down, but if you are like most people, you are detrained to be inverted. Just listen to your body, increasing your angle of inversion only as you feel comfortable. The shipping weight is 75lbs. And the measurements for the box is 48x29x11. It is true that people should not invert if they have uncontrolled high blood pressure. However, inversion can cause a state of relaxation that result in a drop in heart rate and BP (sometimes even lower than at a resting state). Some doctors have used inversion as a treatment for high blood pressure. If you have concerns, you should check with your doctor before inverting. There are many types of fusion surgeries, however the HBI dose not suggest or support the use of Inversion for most type of fusion surgeries and for that reason we have to suggest that you consult with a licensed physician before buying or using an Inversion table. There could be several causes for this. You did too much too soon: If you are new to inversion, your body is not used to being inverted (chances are you haven't hung upside down since 2nd grade!) By inverting too much too soon, you are probably going to be a little sore. You can liken inversion to beginning any new exercise program. If you over-do it on the first day, you will probably pay for it later! You returned upright too fast: When inverted, your vertebrae have a chance to separate and the discs can decompress. This action reduces pressure on the nerves that run through your spinal column. When you ascend (return upright) on the inversion table, your spine "re-compresses"-the vertebrae return to their normal position and the pressure on the discs increases again. If you come up from inversion too fast, you might place sudden pressure on the nerves that run through the spine, which can cause some pain. Instead, you should invert to a mild angle (30-40 degrees) for a just few minutes. Come back up only to the horizontal position (lying flat). Remain horizontal for several minutes to allow your spine to slowly re-compress. Then slowly come up the rest of the way. Always keep in mind that if you experience extreme pain, or if you always experience pain while inverting, you should discontinue inversion until you have had a chance to talk with your doctor. This is probably the most commonly asked question about inversion. The answer really varies with different people. For the most part, we recommend beginners to start slowly: invert for only 1-2 minutes during the first week or two until you become comfortable, and then work up to longer periods of time as you feel necessary. The angle of inversion also affects the length of inversion time that is comfortable. The shallower the angle, the longer the time. Most people will invert for 5 - 15 minutes once or twice a day. There is no real time limit-the important thing is to listen to your body. If you are at all uncomfortable, simply return upright. Virtually all issues of discomfort that occur with new invertees is due to going too far, too fast. You are wonderfully designed to be upside down, but if you are like most people, you are detrained to be inverted. Just listen to your body, increasing the duration of inversion only as you feel comfortable. Many people experience upper back pain as a result of stress and muscle tension. The key to relieving this pain is to totally relax while inverting. Try deep breathing exercises. Also, partner work can be beneficial-nothing is more relaxing than an inverted back and shoulder massage! Movement is also very beneficial. Try rounding your shoulders forward and pushing them back. Also, stretch one arm at a time across your torso to extend those upper back muscles. Please Note: You MUST contact us before returning this product as the Inversion Table and Back Ease Returns Require an RMA # from the manufacturer please contact us at 800-216-4908 or click here to create a ticket to request an RMA#. Your return must be postmarked within 10 days from when your RMA# was issued.